Mad Men much? This lovely lady is ready for lunch hour in a blue dress suit and hair to die for. Hey Vancouver! Get ready for a ride down memory lane because our BC Road Trip Time Machine is heading your way. 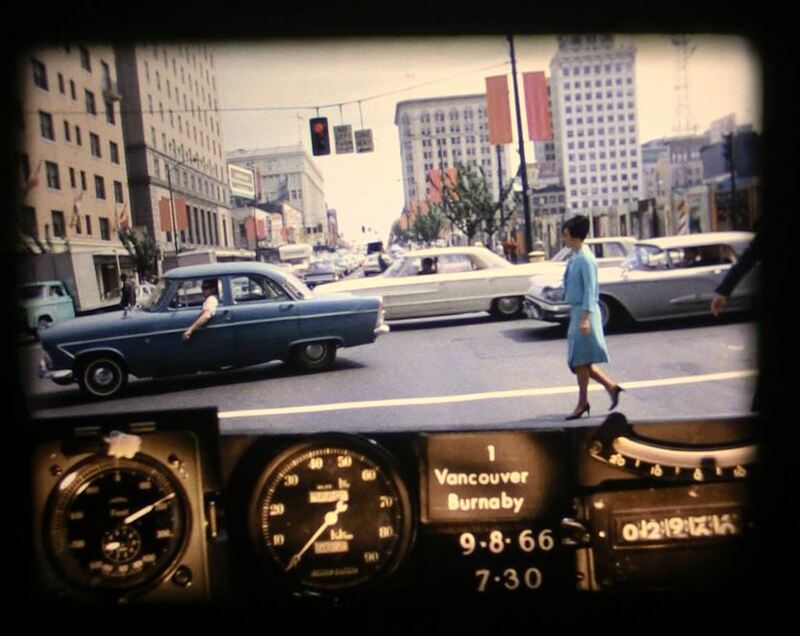 Our archival photolog footage rolls its way from Horseshoe Bay, through West Vancouver, over the Lions Gate Bridge, into downtown Vancouver – along Georgia Street, up Main and out Kingsway, giving you a glimpse of Vancouver as it was in 1966. (It’s safe to say we’ve come a long way from the fledgling port town that we were). Wondering why our photolog camera is capturing road condition information along Georgia, Main and Kingsway Streets instead of BC Highways? That’s because these roads were classified as provincial Highways 1 and 99 until the early 1970s. 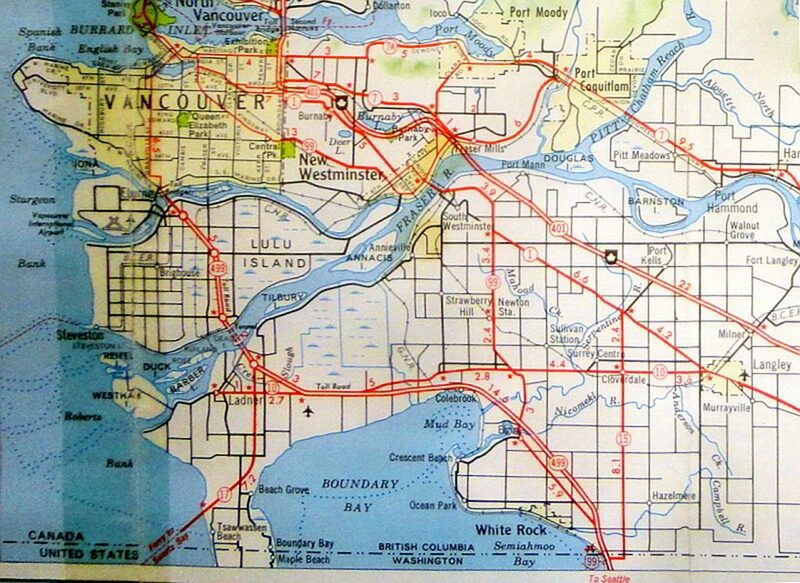 In fact, Kingsway was also a component of the Trans-Canada Highway until construction was completed on the current alignment of the TCH across the Fraser River on the Port Mann Bridge in 1964. As cities grow and change, so do provincial jurisdictional boundaries and interests. As the ministry responsible for provincial transportation routes, we still maintain jurisdictional control over key transportation corridors running through major urban centres; however, it often makes good sense to pass control of secondary routes (like Kingsway) back to the municipality it runs through, so they can maintain control of their important thoroughfare and we can do the job we know best- provincial highways. So sit back, relax and watch this glimpse of a world long gone by in the rear view mirror. These videos are digital versions of 16 mm ‘photologs’ collected by rigging a camera onto a car and taking still images every 80 feet or so. Those stills were then run together as a single film in order to create a visual record of road condition information from across the province. This allowed our engineers to study a stretch of road without having to travel there. Pretty cool stuff, huh? Looking back on these old reels reveals a lot more than just pavement condition. The camera captured some incredible glimpses of our province during the heyday that was the 60’s. Thanks – born in Horseshoe Bay – always wondered what the old Nelson Canyon bridge looked like in use – I would ride my bike along the Seaview trail that is on the old railway bed to the replacement train tunnel at the end of the Seaview trail by Nelson creek – I would then hike up under the new Nelson Canyon bridge to the old bridge and hike up to water towers and Nelson Canyon park – this was before West Van district and Trans Can trail society put in trails. The ministry gave the old Nelson canyon bridge (and Cypress bridge) to the district – now the old rotten Nelson canyon bridge has to be torn down at the district’s expense, and replaced – refurbishing may be to expensive – right now the old bridge provides access to Whyte lake park and the Trans Can trail; it also has a large water pipe layed accross it’s deck surface. Thanks for your comments and sharing your experiences with us! Sad to hear the old bridge might not survive. Amazing! Thank you Dave. Can we share your wonderful work to highlight some of the changes along the route? Thank you for this but I wish it could be slowed down somehow. It zooms along so quickly that it is difficult to take in details. Would you believe we slowed this down to 30 percent of its original speed? There is a small gear button on the lower right of the YouTube screen which you can click and further reduce speed if you like. Hope that this helps! very informative ad interesting to see how it was and what it was like back then. tHAnks for sharing thisto us! I really enjoyed it. I still drive part of that route every Sunday. And the old Georgia Viaduct, Kingsway…wow. Thanks for posting. Thanks for your comment Roberta. We think it is pretty awesome too. Stay tuned for more! Love the travelogue and the map which clearly shows Lulu Island. This was what it was like when I lived there in the early 1950s. This video from Horseshoe Bay states in the title that it ends in New Westminster. It should be corrected. It actually only travels to Kingsway in Burnaby, the film ends just between Nelson Avenue and Royal Oak! Thanks for this it is very cool! Noted Jim – thank you!